As craftsmen, artists, and hardscape enthusiasts who pride themselves on quality work, overjoyed customers, and long lasting installations, we don't take lightly any opportunity to work with you on your latest residential or commercial project. 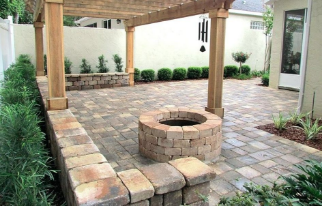 Our continual goal of maintaining a position as the most trusted and highly regarded pavers Melbourne FL has to offer, is pursued with constant dedication to customer care, using only the best quality materials, and attention to the details of every job and pavers installation. Understanding that the home is not only a place of rest, but an extension of one's personality and values, projects of all sizes require careful planning and decision making. As such we want to make sure that choosing the best paver company is the easiest part, and we do this by providing clear cost estimates at low reasonable prices, full transparency on timelines and process of construction, as well as even design help with paver patio ideas or hardscape layout design if desired. 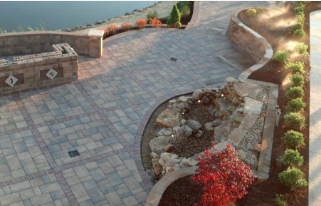 Driveway pavers, walkways, retaining walls, pool decks, and countless other patio paver creations are all fantastic ways to bring character and a vibrance to your home or business. 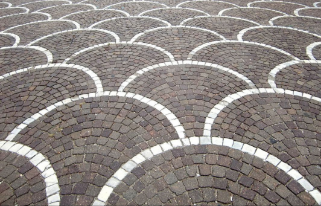 It's no surprise that paver stones have been utilized for thousands of years throughout history, from Roman stone roads, Italian cobblestone, Parisian sett pavement, and the well known brick pavers of Siena. This construction method has long been a balance and display of beauty and robust lasting utility. With the last couple centuries giving rise to the use of interlocking concrete pavers, also known as segmental pavers, the ease of manufacturing them at affordable prices has made them once again a very popular feature in modern times. There is definitely something to be said for the way in which landscape pavers carry so much history with them, as well as a presence of tasteful distinction. If you have been looking for something to take your property to that next level of uniqueness and value, this could be a great option for you. The other excellent trait that this style of stonework has to offer is the endless amount of customization that can be done to make an arrangement specific to your taste and a truly one of a kind installment. Whether it be with flagstone, brick, tavertine, concrete, granite, marble, or any other possibility offered by well established brands like Belgard or Cambridge, the room for creativity and personal expression can take countless forms with stone shape, patterns, colors, spacing, and much more. One of the beauties of deciding to with a paver driveway or patio is that you can really start with essentially a blank canvas! Otherwise we can of course also work with you to discover all of the possibilities, and guide you through all of the things we have seen throughout our years in the field. 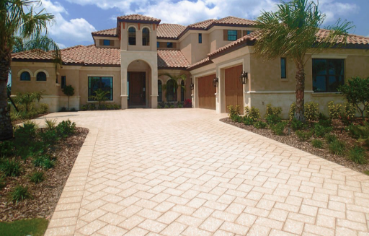 Our highly skilled team of locally based Melbourne FL pavers collectively have many decades worth of experience providing paving services throughout all of Brevard county including Palm Bay and Rockledge Florida, and we would be happy to take on your call today to get you started on your next home improvement vision with free calculated estimates, information, or possible ideas. The benefits you can expect when making the decision to go with paver patio stones definitely include but also go well beyond the fantastic aesthetic enhancements they bring to any home or landscape. A pavestone driveway, walking path, or pool deck not only makes your home more inviting and enjoyable for yourself, but the market will see it this way as well, and if you ever choose to sell, such an installation could greatly increasing your property value and turn around time. Real estate marketers have suggested that it is in fact one of the top ten things a home owner can add if they are looking for valuable home investments. Many times a house sale is made when prospective buyers instantly fall in love with an exterior before having even looked at the interior details. The curb appeal added by a stone installation can go along way in ensuring and highlighting the value of your property, as well as easily generating revenue that far exceeds the initial pavers cost. Additional pros include a low cost of maintenance, which if you decide to use patio pavers for you backyard means a great leisure space without all the headaches of weeding, watering, and mowing. While in terms of actual brick and stone upkeep, this is one of its best characteristics, because whenever you have any damages you can simply replace single bricks at a time when necessary as apposed to the much more complicated resurfacing required on asphalt or concrete pours. You will also save a ton in the long run as this type of construction does not need continual staining and sealing. Furthermore when you decide to go specifically with permeable interlocking concrete pavers, you will find excellent function in terms of water management and drainage, which can also be achieved by simply layering tightly packed sand between the pieces. It is also very practical when it comes to the maintenance of things existing around your surfaces, for instance if you need to access pipes or cables underneath a driveway, this becomes a lot less intensive when you can easily remove and place back the sections required. Paved surfaces and driveways are also great simply because of their pure strength, for the value they bring in durability and impact resistance they are extremely cost effective. This can play an especially critical factor if you are in an area of commercial industries or are looking for a solutions that satisfies business exteriors with heavy traffic such as restaurants, resorts, or apartment complexes. Finally, one other major valuable attribute to pavers is their non skid and slip proof nature. The natural material surface as well as sometimes even their spacing can both provide an extra amount of grip particularly when they get wet. This comes in very handy when they are used around pool decks and boarders where safety is even more of a concern. Whatever your desires or goals may be, there are many great reasons to consider using the numerous paving options readily available, and to start creating your new backyard oasis or grand business entryway in a format that will save you in the long run, increase your value, and add function as well as that extra bit of class to it all. If this is of interest to you, feel free to call and connect with one of our many awesome paving contractors who will be glad to meet your needs and answer any questions. While the exact process of any installation can of course vary based off the specific hardscape feature desired, there are some fundamental steps you can expect for most projects. We will list them here to give you a better understanding of the work often required to create a successful addition, as well as for those who may be interested in the DIY pavers route, in which case we would be happy to simply consult and provide tips. First and foremost, it will be necessary to come up with an idea, desired look, or concept, as well as to develop a fairly detailed layout plan from that. The things that should be considered at this early stage not only entail aesthetics and materials selections, but safety, existing ground and environment makeup, as well as a system for proper water drainage, which is typically recommended to be no less than one quarter inch slope per linear foot. Next, it is imperative to run all plans past the codes that may exist in your particular area as well as with your utilities providers. All piping and wiring should be clearly marked before construction begins to prevent possible damage. In the next phase, once you begin picking out which style of pavers you would like to use, you should get a rough estimate of how many you will need to obtain, we usually do this by adding five to ten percent to the square footage depending on which types of patterns are desired. It is a good idea to always have more supplies on hand than you might assume, as some will need to be cut down to custom shapes for edges and obstacles, as well as to have replacement pieces on hand for the future. Once we are ready to begin the actual installation, our paving contractors come on site and mark out the entire area using a transit, laser, or suspended horizontal lines over the ground to begin solidifying the final target for surface height and slope. For this part, it is extremely critical for it to be done correctly as it will define the overall alignment and smoothness of transitions between pieces. Our next step is excavation, in which we begin to dig out the location allowing proper depth for the functionality needed. Walkways and patio pavers may only require a 4 inch base, while a driveway which sees heavier use could need up to twelve inches. Once the area is recessed, we begin the process of filling and compacting the base material, which is commonly a crushed stone mix, chosen for its strength and its water draining ability. Using plate compactors we slowly pack the material layer by layer, checking often to ensure that the surface is planar and sloped per original design. Afterwards, metal edge constraints are added to the perimeter of the work area to ensure long lasting shape, and are secured into the ground with long stakes. Depending on the shape of your overall design, we custom cut these pieces as well too fit around tight radiuses or other curves. The last stages of the process include laying and packing the sand on which the stones will rest, strategically and carefully placing all of the pavers down, and finally tamping the pavestones into the sand, making sure everything is as tight fitting as possible. After sweeping and cleaning the entire work area we put a final protective coating on the surfaces with paver sealer. Though this is only a brief overview, and the actual field work requires many nuances, our professional Melbourne and Palm Bay pavers have gathered extensive knowledge on all stages of a huge variety of projects. So you can rest assured, if you decide to work with our devoted team you will receive industry leading skills and exceptionally well versed and friendly craftsmen. To begin creating something beautiful and long lasting today, simply give us a call!